Franklin campus. Within a few years the continuing growth required further expansion, which was difficult at the Franklin site since urban development surrounded the campus. In 1956 the Knollcrest farm was purchased for $400,000, and Spoelhof oversaw the gradual process of moving the school to the new site. The construction required extensive fund raising. The seminary move to Knollcrest began in 1960 and the college completed this transfer in 1973. Toward the end of the 1960s Spoelhof also had to deal with the impact of nation-wide student protest movements on the Calvin campus. 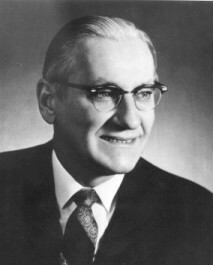 As the school prepared to celebrate its centennial in 1976, Spoelhof announced his retirement as the longest serving president to date. After retiring, he worked briefly for the United States Information Agency. In 1935 Spoelhof and Angeline Nydam (1909-1994) married. They had three children, Robert Spoelhof, Elsa Scherphorn, and Peter Spoelhof.